Infographic by Canva/The Black Capitale. Data from Investopedia. WASHINGTON– Cryptocurrency has gained popularity since its inception in 2009, yet according to several studies, the typical miners and users are white, young, and male. The African American community, however, appears to be missing out on the movement due to a lack of knowledge and distrust in the process. Despite this, a number of African American advocates want to diversify the cryptocurrency space. Cryptocurrency, according to Investopedia is a digital or virtual currency that uses cryptography for security. This type of currency, though, is created and stored using a system called a blockchain, which is a digital ledger where these transactions are recorded. Cryptocurrency, generally, is also completely independent of a central banking system. Though there are hundreds of coins, the most popular types of cryptocurrencies are Bitcoin and Ethereum. Bitcoin, with a market cap of $168 billion, is the most known and has grown by over 1,000 percent in value since the beginning of this year. Technology veteran, Tavonia Evans, founded the $Guap Coin this year to involve African Americans with cryptocurrency. The $Guap Coin is the first initial coin offering (ICO) that plans to “recycle wealth within the black communities”, according to the website. It’s built on Ethereum’s blockchain technology and came from a conversation about Black Wall Street between Evans and an interested patron. In addition to Evans, four tech-savvy and business experts are also trying to modify the space by creating a crypto-hedge fund called Amentum. Lack of financial literacy spurs disengagement? A lack of not only cryptocurrency knowledge, but also financial education, has led to seemingly low numbers of African Americans involved. Advocates have led multiple efforts to increase the numbers of cryptocurrency users in the African American community. One such person is Edwardo Jackson, the founder of the “Blacks In Bitcoin” blog. Jackson told The Black Capitale that he started this blog in 2013, to increase awareness within his community. Aram Barnett, founder of the blockchain consulting company, Alluminate said that African Americans might be hesitant to participate in cryptocurrency because they don’t understand how something like a blockchain work. “I think it’s less of I don’t know, hesitation-wise, but it’s I don’t know like what is blockchain? How does this work? Why do I care? So wait there’s nobody putting the money?” Barnett told The Black Capitale. “ Where is the bank? I get asked a lot of questions like where is the central bank?” Barnett said that Alluminate is pushing the “future of the blockchain” and plan to expand on what it means and how it works. Blockchain is a “digitized, decentralized, public ledger of all cryptocurrency transactions,” according to Investopedia. The data that it collects is protected by the coding technique, cryptography, while all transactions are conducted virtually. Jackson also believes that the lack of trust from African Americans toward banks leads to a distrust in cryptocurrency, although most advocates have said that the independence from the banking system is a reason to get involved. “African Americans may be more wary about banks because housing and loans consist of predatory lending and all sorts of financial system injustice have [been] waged over our community,” he said. The Federal Deposit Insurance Corporation found in 2015 that roughly 18 percent of African Americans were unbanked and held the largest percentage of unbanked households in the country. Promoting financial education and freedom is a reason that Evans created the $Guap Coin. “Financial education, financial planning, wealth building — it exists but, we have more of the predatory financial institutions surrounding our community,” she said. African Americans could also be wary of cryptocurrency based on its initial reputation in the media. It was used on the dark market by cybercriminals. Cybersecurity fears and cryptocurrency users being labeled cybercriminals could also be other reasons why some might be afraid of joining the new movement. Alan Cohn, blockchain attorney at the Washington office of Steptoe & Johnson LLC, referenced the 2014 Mt. Gox exchange scandal as an example of cryptocurrency being used for crime. The Tokyo-based Mt. Gox bitcoin exchange went bankrupt after it lost about 850,000 Bitcoins from its Japanese bank accounts, which the company blamed hackers for. The former head of the exchange, Mark Karpelès was accused of embezzlement and data manipulation as a result. Former FBI cyber intelligence analyst, Luke Wilson, told The Black Capitale, that he did see cybercriminals use cryptocurrency to commit crimes, but felt those who are discouraged from cryptocurrency had more to do with the novelty of the technology. As cryptocurrency continues to grow, African American advocates vow to continue pushing the message. The Howard University Blockchain Labs (HUBL), is one such group. “HUBL seeks to be a gateway to help the Howard University community learn and get involved in Blockchain Technology,” the organization told The Black Capitale. 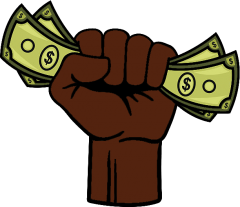 Cryptocurrency, though slow, is making its way to black spaces around the world, especially with more African American supporters infiltrating the space.